Deep vein thrombosis is the name for blood clots that develop in larger veins such as in the legs. 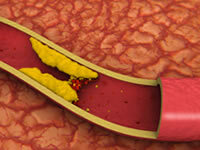 Thrombosis means blood clot and deep veins are those that lie within the muscle and not visible through the skin. Deep vein thrombosis affects about 1 in 1,000 people each year. People with diabetes may have an increased risk of DVT, particularly those that have needed surgery or have other inflammatory conditions such as rheumatoid arthritis. In some cases, deep vein thrombosis may present no symptoms. If symptoms occur, these can include pain, swelling or aching in the affected leg, often in the calf. You may notice redness or warm skin at the affected part. If the above methods cannot confirm DVT, a venogram may be used. A venogram involves a dye being injected into the foot and X-rays can detect whether the dye is blocked by a blood clot. Deep vein thrombosis is a blood clot and is more likely to occur if we are not able to move around for long periods of time and the blood in the veins slow down. For this reason, deep vein thrombosis has been linked with long distance flights of 8 hours or more. Being in hospital can increase the risk of DVT as movement may also be limited for long periods of time. Pregnant women and women on the combined contraceptive pill or hormone replacement therapy also have an increased risk of DVT. Treatment for DVT will include being given an anticoagulant, such heparin or warfarin, to prevent the blood clot getting worse. Anticoagulants can also prevent the clot from breaking off which can be a life threatening complication of DVT. Treatment also includes wearing a compression stocking. The stocking is to be worn all day, each day for at least two years to help prevent future clotting developing. You will also be advised to keep your leg raised when resting as this can help the blood to flow from your leg. DVT may result in complications affecting other veins in the leg. This is known as post thrombotic syndrome and its symptoms include pain, swelling, a rash or ulcers on the calf. Speak to your doctor if these symptoms appear. A serious complication that can occur following DVT is a pulmonary embolism, also known as a venous thromboembolism (VTE). A pulmonary embolism occurs if part of the blood clot breaks off, travels through the veins and gets stuck in the pulmonary artery, preventing blood reaching the lungs. Symptoms of a pulmonary embolism include chest pain, a shortage of breath, coughing, feeling faint or passing out. Call the emergency services if these symptoms appear as a pulmonary embolism can be severe and can cause death. VTE is estimated to affect 1 in 10 people that have had DVT.